PC golfers can now re-create their home courses with the Arnold Palmer Course Designer (APCD). More than a toy for entry-level builders, the APCD provides users with the power and versatility to accurately re-create their home course in a powerful real-time 3-D system. Players can tweak every inch of fairway with the APCD and create tunnels and arches with full control over each point on the course. A robust library of trees, shrubs and other vegetation allows players to sort for the climate and season that fit their home course, or they can import their own custom trees. Open My Computer and browse to the folder where you downloaded APCD1_5.exe into. Double click APCD1_5.exe to start the installer. The APCD Course Locker utility is a safeguard feature that lets you prevent others from editing an APCD course. The APCD Update v1.1 adds new features and fixes several issues with the Arnold Palmer Course Designer. 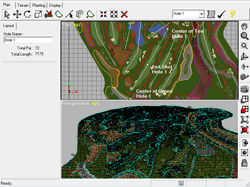 Added features include Terrain Painter, Game Cam, Hole Preview, the ability to import elevation data, and much more. For more information on all of the added features and fixes, please view the README included.